Resolved Amber Alert: Jinjing Ma is Asian, 4 feet 11 inches tall. 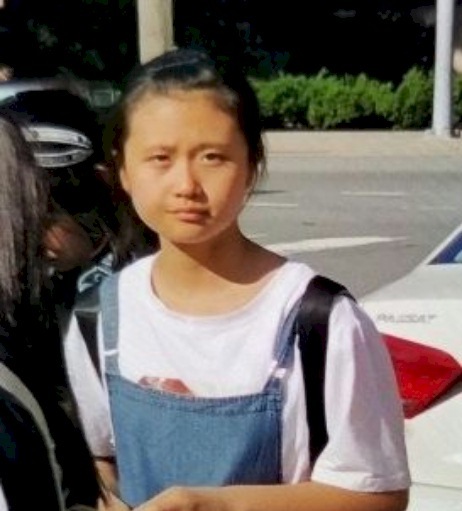 Police issued an Amber Alert for Miss Ma, a 12-year-old girl visiting from China with a tour group who was abducted from Reagan National Airport Thursday. Photo courtesy Virginia State Police. UPDATE : The child is now in the care of her mother. Jinjing Ma’s abductor seen in security video appears to be Asian, black hair, about 40 years of age, 5’2″ and wearing a black dress. Eventually it was learned this person was her mother. The woman had been living in NYC legally and had not seen her daughter for two years. The child has been released to the custody of her mother amidst much relief in a resolved Amber Alert case. This 12-year-old girl was intercepted from DCA airport Thursday morning. She was visiting from China. She’s believed to be in a white Infiniti SUV with a woman and man. The FBI is involved in the search. Virginia police feared the child was in extreme danger. Anyone with information on the case is asked to call the Metropolitan Washington Airports Authority at +1 703-417-2400 or Virginia State Police at 800-822-4453. 12-Year-old Jinjing Ma was with a tour group visiting America from China, police said. She had received her passport just prior to checking in and left her group when she encountered the unknown woman. The woman helped Ma change clothes, and the two walked together to the arrivals area of the airport and disappeared out of camera view, police said. Airports Authority police are working with the FBI’s office of child exploitation and human trafficking task force; Virginia State Police; and the National Centre for Missing and Exploited Children.